I’ve been doing quite well with reading books for my 10 Books of Summer Challenge – but not so well at writing reviews of them. 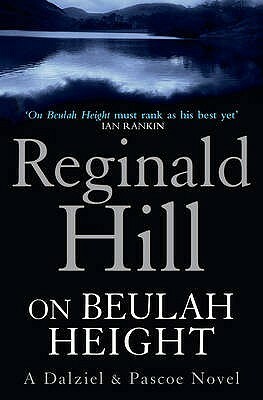 I loved On Beulah Height is Reginald Hill’s 17th Dalziel and Pascoe novel. He wrote 25 in this series and although it would probably make sense to get a picture of their development I’ve been reading them out of order. It doesn’t seem to matter much, but in this one there are a few references to something that had happened in an earlier case (told in The Wood Beyond) that had affected Pascoe personally. It had filled him with anger and it is still affecting him, whilst investigating this case. But this book can easily be read as a standalone novel. It is not just a crime fiction novel, it is also a book that raises many issues about parenthood, the relationship between families and their children and the devastation and anguish of parents and a community at the loss of a child. Fifteen years later another little girl, Lorraine, also aged seven went out for a walk one morning with her dog before her parents got up and didn’t return home, reviving memories of the missing children from fifteen years earlier. It was a case that has haunted Dalziel – and the fears increase when a message appeared, sprayed on the walls: BENNY’S BACK. It’s been a hot, dry summer and the buildings beneath the reservoir are gradually becoming visible and tensions are rising as memories of the missing children increase the fears for Lorraine’s safety. This book is tightly plotted with many twists that made me change my mind so many times I gave up trying to work out who the murderer was and just read for the pleasure of reading. Hill’s descriptive writing is rich and full of imagery. The main characters are fully rounded people and the supporting cast are believable personalities, often described with wry humour. There are so many books I want to read, so it’s not surprising that some slip through the net – or the sieve in the mind! I love Hill’s books and most of Ruth Rendell’s too that I’ve read – maybe the later books not so much. I hope you find some of their books. I think that’s one of the great things about Hill, Margaret. He created complex plots and rich characters, so that you want to just read the story for the pleasure of reading it. And this one does explore a lot. I’m not surprised you want to go back and ‘unfold’ it some more. This is actually the only book in the series that I’ve read. We did it a few years ago in the mystery group and paired it with Peter Robinson’s IN A DRY SEASON. That book is also about a hot summer and a reservoir and crimes that come to light. I keep thinking that I’ll read more in both authors’ series, but then select something else. Like Cath, I also keep thinking I’ll read more of Ruth Rendell/Barbara Vine. Sigh. If I could only read at about 3 times the speed – ha! I love the entire Dalziel and Pascoe series, but On Beulah Height is in Hill’s top five for me, for all the reasons you cite in your review. He’s such beautiful writer and the way he is able to juggle multiple storylines and points of view is amazing. I’ve read many of his books more than once, and enjoy listening to them in audiobook format as well. I’m so glad you enjoyed this one. I have no doubt I’ve told you this a million times already, but it’s my favourite crime fiction novel of all time, and tends to be the standard I judge others by. I really feel it stands up there with the best of literary fiction – his writing is at its best in it, I think.